"The John C. Calhoun Hotel welcomed its first guests in 1925. Designed by architects James J. Baldwin and James H. Casey, the hotel was built by the Fiske-Carter Construction Company, one of largest contractors in South Carolina in the 1920s. The Calhoun is once again welcoming people to Downtown Anderson with its luxury condominiums and was a film site for the movie Leatherheads." You can read more about the Calhoun's history and architecture on this nomination form for its inclusion in the Anderson Downtown Historic District. Meanwhile, the back of the envelope features an advertisement for a vacation spot more 160 miles to the north — Mayview Manor in tiny Blowing Rock, North Carolina. Blowing Rock had its intial heyday in the 19th century as an upscale destination for those seeking a healthy respite from city life. Its history as a haven dates to the Civil War, when some Confederate soldiers sent their families to Blowing Rock to keep them safe. After the war, many of these soldiers joined their families there and remained. In the late 1800s, city-dwellers in western North Carolina also began traveling to Blowing Rock to enjoy the air and the scenery. And, thus, hotels began to spring up. 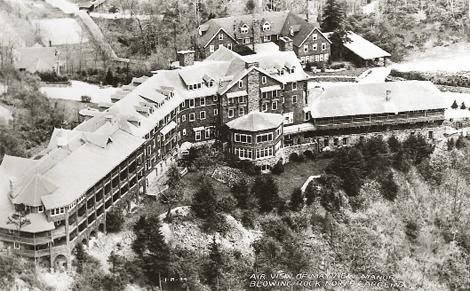 Blowing Rock resident Walter Alexander opened Mayview Manor in 1922. "Mayview Manor was an elegant 138-room hotel. ... [It] was constructed of pre-blight chestnut wood and native fieldstone. Its exterior was covered with chestnut bark. 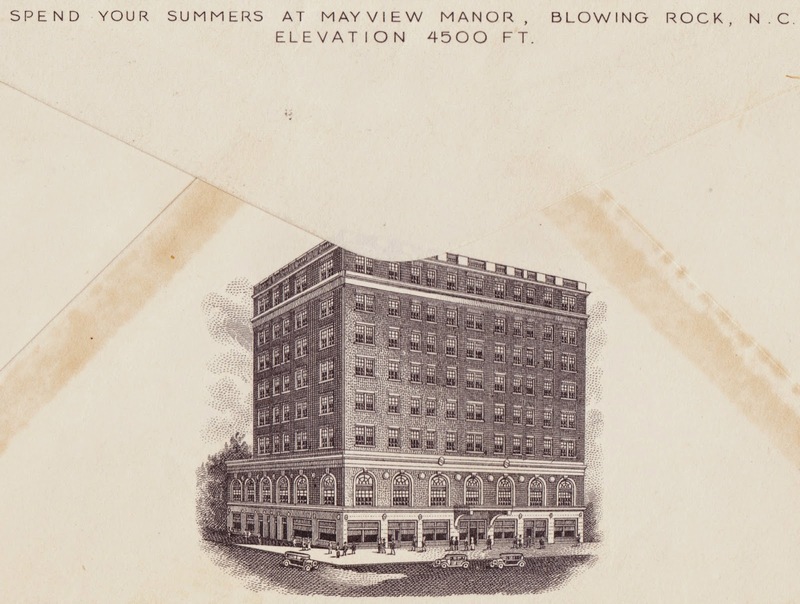 Mayview was considered a perfect getaway for the rich, and elegant entertainment and fine dining were a hallmark of the hotel. For over 40 years the Boots and Saddles Ball, held during the week of the annual Blowing Rock Charity Horse Show, was one of the most popular events at Mayview Manor. After its closure in 1966, Mayview Manor sat dignified and empty until it was demolished for a housing development in 1978." "In 1924, Mayview started a gun club directed by sharp-shooting legend Annie Oakley, who came out of retirement for a last hurrah. One account tells of a 63-year-old Oakley in fine form as she blew away 98 of 100 clay pigeons." Here's an old photo of Mayview Manor. 1. The URL is http://rebcole.tripod.com/mayviewmanorblowingrocknc/. The site features some interesting photos and documents related to Mayview Manor.